If you already have a walk-in shower stall, then it is an easy step to create the look and feel of a spa in your bathroom. Glass showers can be a great way to actually expand the visual effect of even a small bathroom. Not only that, but a glass door or a glass shower surround is an incredibly modern design that makes it possible to show off your gorgeous tile or other fancy fixtures in the shower. Want to create the ultimate in glass showers designs? The most affordable option for glass showers in the bathroom is with a technique known as framing. This will have a new glass door installed on your walk-in shower along with several glass panels. Each of these panels will be joined by a strip of metal. This helps to create a waterproof barrier around the door (and individual panels) which helps to prevent leaks and other water damage. 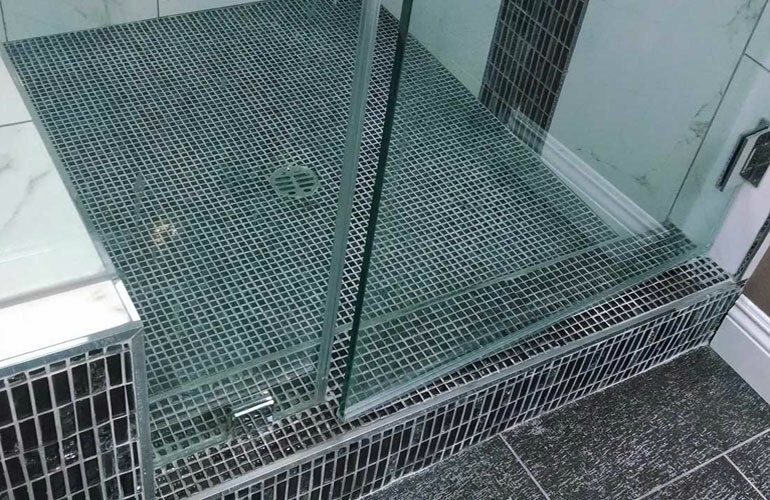 There are many other options that can be used for creating a customized glass shower for your home. There are very modern designs now that only use glass of a few sides, leaving one (or more) areas open. This would likely be most appropriate for use in homes with a large bathroom and shower area. However, if your home can handle this, it is a very impressive look. We also offer a number of other options for bathroom redesigns. This can include handling your mirrors and even the installation of custom mirror walls, which can create some very impressive looks and optical illusions to give the impression of more space. Or, we could simply design a custom bath enclosure and / or shower door.